One of the best matches of the year is set for this weekend as Bay Area rivals Cal and St. Mary's tangle. 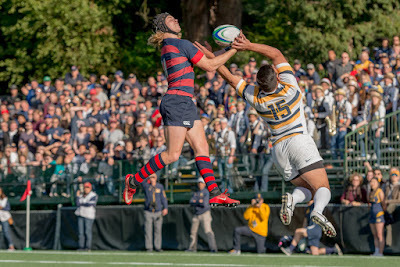 This has turned into an absolute stunning rivalry over the last few years and is arguably the best game of the year on the college rugby calendar. This year it could also be a preview of the DI-A final, which will also be played in the Bay Area. At the center of the rivalry are two fantastic coaches. Jack Clark is a legend for Cal while Tim O'Brien is the same for St. Mary's. O'Brien in particular deserves some extra praise. He has molded St. Mary's into an absolute powerhouse the last few years. Five years ago matches between Cal and St. Mary's always went to Cal. Now, St. Mary's has the advantage. From a fans perspective it is one of the best matches to watch purely from an entertaining factor. Both sides are well drilled and play great attacking rugby. Not only do we want to make strong rugby players in America but we also want to play attractive rugby. While both teams are strong this year if we had to give an edge to one team it's St. Mary's. They are very difficult to face at home and will be looking at this match as an opportunity to once again show up their Bay Area rivals. The match starts at 4:00 p.m. et/1:00 p.m. pt and will be streamed.